No matter how confident you may be, final exams are almost certain to provoke anxiety. Your performance on these tests is crucial to your academic standing, and the opportunity for do-overs is rare to nonexistent. That’s why you may be stressed out, even if you understand the material. But letting it overwhelm you could lead to serious issues. You might begin to second-guess yourself, lose sleep or forget the things you spent so much time studying. This is why it’s a good strategy for students to embrace a proven routine to prepare for tests and manage stress. Taking care of your body can be almost as beneficial as studying when it comes to improving your performance on midterms or finals. That’s because your physical state can have a significant impact on your ability to memorize, think and reason. Neglecting to take care of your health and well-being could result in your brain functioning at less than full capacity. Getting plenty of sleep, eating right, and drinking enough water can all boost your test-taking abilities and maybe even help you attain better grades. For example, many students don’t realize that proper hydration is crucial to their performance at exam time. Dehydration can lead to irritability, fatigue, and lethargy — all of which will keep you from doing your best work. People who drink a bottle of water while taking an exam perform slightly better than those who don’t, according to research. Good nutrition also can play an important role in how well you’ll do on your tests. That’s because the brain uses as much as 20 percent of the body’s daily energy needs. Eating healthy can help you remain alert and energetic, so you won’t falter during the marathon that is finals week. Given how important grades can be to your future, you need to be at your best during testing time. Don’t let bad habits like filling up with junk food or sleeping poorly hurt your chances to succeed. See the following tips you can use to reduce stress and ensure that you’ll be firing on all cylinders during exams. It is scientifically proven that using proper breathing techniques can help improve the ability to retain information while studying and taking an exam. While you are studying, take a deep breath through your nostrils, then hold for 3-5 seconds. Then, exhale for 1-2 seconds. It is important to sleep well before an exam, as your mind responds more quickly and efficiently when it is well rested. In turn, there is no need to stay up all night trying to “cram” information. Make sure you are attempting to get at least 8 hours of sleep before an exam. Try to set your alarm 1 hour before the time you need to actually wake up. This way, you can benefit from hitting the snooze button a couple times in order to feel more rested. Researchers have found that those who drink a bottle of water during their exam have scored an average of 5% higher than those who don’t. Dehydration can make you feel sluggish, irritable and tired. Bring a bottle of water to your finals. Your brain will thank you! Although the brain is one of the smallest organs in the body, it can use up to 20% of the energy we need every day. By having the right foods and drinks to energize your system, they can improve attentiveness and help sustain you through many exam hours. On the contrary, making the wrong dietary choices can make you feel slow and tired. It’s important not to skip meals — especially breakfast. After waking up, your body hasn’t had any food for several hours during sleep. Breakfast can give you the energy you need to start the day right. *Opt for healthy snacks such as fresh fruit, popcorn, fruit scones, dried fruit, yogurt or nuts to keep you going throughout the day. 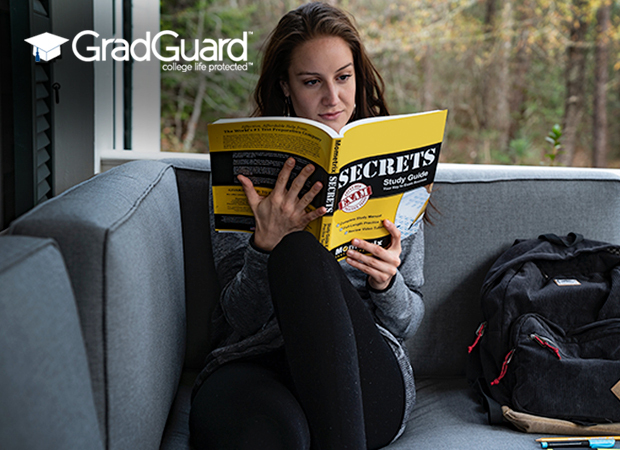 Testing season is definitely a stressful one, but as long as you remember these tips from GradGuard, it will be smooth sailing! Author bio: Dr. Kenya Grooms is a clinical psychologist and Dean of Student Affairs at MacCormac College, the oldest two-year, private, nonprofit institution in Illinois. MacCormac offers educational programs for court reporting, criminal justice, business administration and more. Dr. Grooms has written and presented about family life, international partnerships, personal resilience, support services for non-traditional students and many other topics in psychology.